Greater Boston area document scanning, with frequent on-site scanning throughout New England. For over 25 years Boston Computer Scanning (Bosscan) has been providing safe, secure and reliable scanning services. 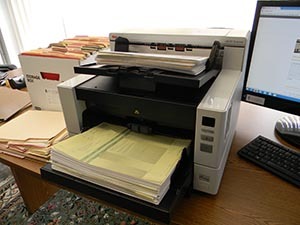 We are equipped to handle any document scanning project at our office or yours. This includes Rush or Emergency jobs and "on-site" work usually within a 24 hour notice. Let us electronically organize your paper documents from their current folders, binders and drawers. Whether your documents are single-sided, double-sided (duplex), or even have stapled or clipped attachments, we have come across an assortment of formats and are equipped to handle it all. We scan documents ranging in size from index card and letter/legal size pages up to blueprints and maps! Let Bosscan take your paper filing system and scan in your documents for you to access anytime, anywhere. If you are overwhelmed and unsure of where to start, take a look at our case studies from actual projects that we've worked on, then call us 781-245-1050 to discuss your project. At Boston Computer Scanning, we take the time to listen and work WITH you to create a solution that works FOR YOU. Now you may be wondering what makes Boston Computer Scanning (Bosscan) different from the dozens of other service bureaus popping up on the internet these days. Fair question. We could tell you it’s our 25+ years experience, our knowledgeable staff, our security policy and procedures, our attention to detail, how we never lost a document in over 25 years, etc., etc., etc… While it is all of these and more, what really separates Bosscan from the others is our attention to our customer’s needs. We really are concerned for you and your documents. You will find when you’re working with us that all of our staff will come to know you, and your project. In fact, we are often told by customers that we know their record keeping better than they do. That’s because we consider it our job to know your work. We feel a great sense of accomplishment when we complete a project that results in saving a customer time and money. Frankly the only feeling worse than losing money on a project is getting paid for completing a project that didn’t result in productivity and cost savings for the customer. No customer of ours pays for work they are not completely satisfied with. If you are overwhelmed and unsure of where to start, take a look at our case studies from actual projects that we've worked on, then call us at 781-245-1050 to discuss your project.